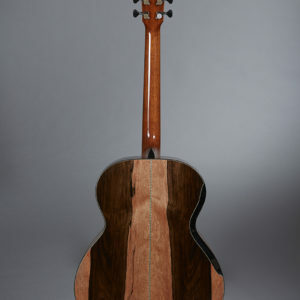 William ‘Grit’ Laskin is a renowned Canadian luthier who has crafted guitars since 1971 for collectors and musicians including k.d. lang, Tom Cochrane, and Rik Emmett. 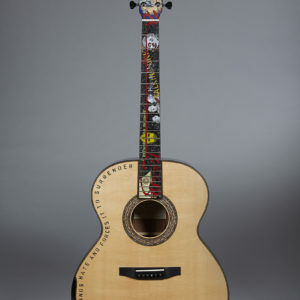 He also uses his guitars as “canvases” for his engraved inlay art, and as a tool for communication. Laskin is also a multi-instrumentalist singer-songwriter, appearing at occasional clubs and music festivals. In 1996 he founded Borealis Records with Ken Whiteley, Canada’s first national folk music label. 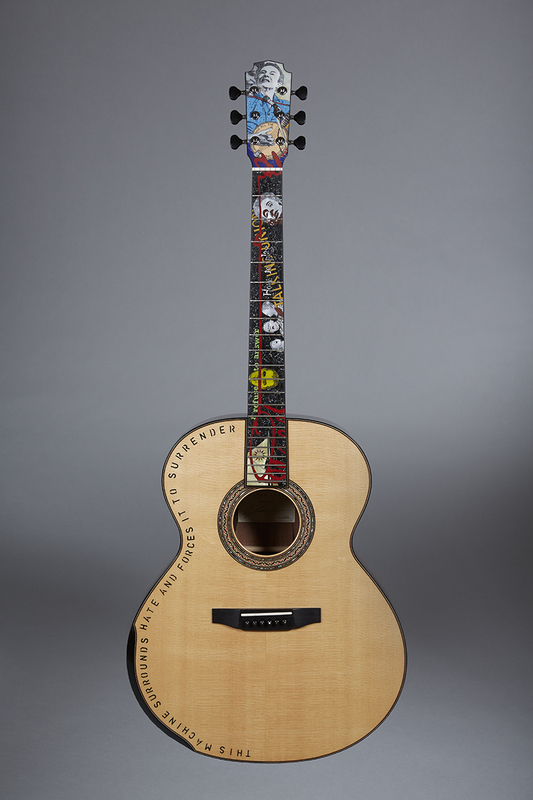 This guitar, a tribute to Pete Seeger (1919-2014) features artwork and text highlighting major influences and events in Seeger’s life, as well as his interest in politics and environmental activism. Written on the body (with alcohol-based pigment) is the phrase he routinely wrote on his banjo head. 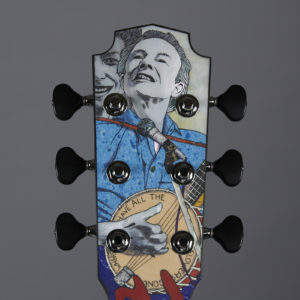 In the headstock we see the banjo-playing younger Pete, with his wife Toshi behind him. 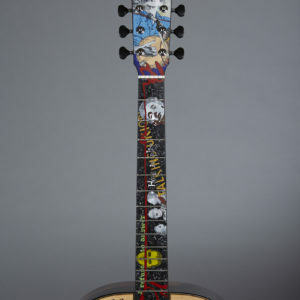 On his banjo, given that his political statement is now on the guitar top, Laskin wrote the title of one of his most well-known songs: WHERE HAVE ALL THE FLOWERS GONE. 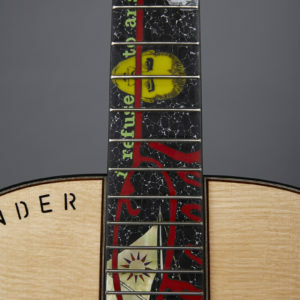 On the fretboard, the first thing you see is a very large version of Pete’s standard signature scribble of a 5-string banjo done in Red Coral stone. 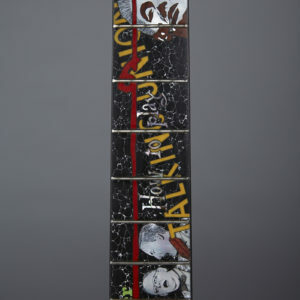 This runs the length of the neck and into the headstock, serving as the visual ‘spine’ of the narrative. Moving from the nut to the higher frets, we see Woody Guthrie, then the phrase TALKING UNION, which was the title of the first song collection put out by Almanac Singers (the precursor to the Weaves), a signer’s collective that included Woody and Pete. Intertwined with “Talking Union” are the words “How To Play,” which is the first phrase of the title of Pete’s famous banjo instruction book: “How To Play The 5-String Banjo”, which came out in the late 1940s. Next we see the other three members of The Weavers, as depicted on the cover of their most famous album: Live at Carnegie Hall, 1955. Then we see the chair of the House Un-American Activities Committee, US Senator Joe McCarthy, depicted upside down and in ‘cowardly’ yellow. Around him are the first words from Pete’s actual statement to the Committee: “I refuse to answer…” Pete was of course blacklisted for decades because he refused to name names. Finally, we see the upper sails of the sloop Clearwater, which Pete sailed up the Hudson River year after year to protest its pollution. He and other musicians would stop in each town, perform a concert, and then encourage political action to clean up the river. They were successful – the Hudson is much cleaner, fish species have returned, and there is even a permanent environmental music festival called Clearwater.